So for Dad’s birthday, I needed a fun, easy, cheap gift since the stuff he really wants isn’t available yet or not my area of expertise to buy. Thanks to my new addiction Pinterest, I found this little gem. So I loaded up the kids and headed out to the drug store. They didn’t have everything to make our version, so we had to make two more stops. All in all, I thought it turned out super cute. I wish my handwriting was a little neater and my lines were straighter, but I had to fit more candy on my card…so that’s my excuse. 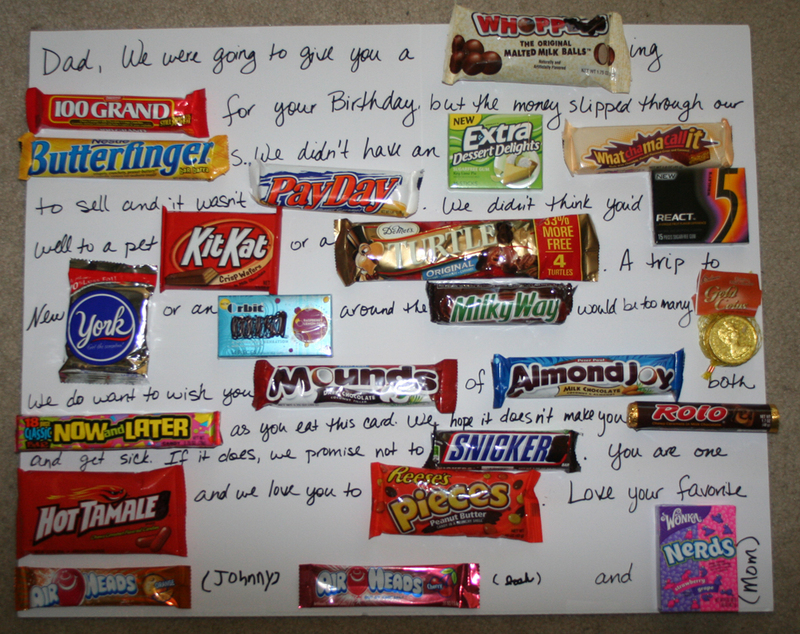 This entry was posted in Hodge Podge and tagged birthday, candy, card by ckcringo. Bookmark the permalink.